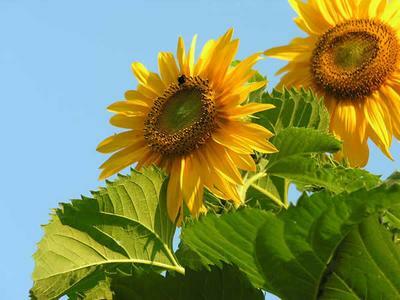 I love the bright yellow color of sunflowers. I have been planting them just outside my backyard fence for the last couple of years . Our backyard looks over a pond. There is a walkway right round the pond, so many people pass my garden every day. The sunflowers make a large statement and has stopped many admirers! They create a gateway to showing off the rest of my garden. I love sitting on the deck after a hard day's work and look over my garden and the pond beyond. It is very relaxing and interesting to watch the passers-by. I saw one lady walking by slowly for three days in a row. She finally got enough courage, stopped and asked me if I would please give her one of the sunflowers. Her son had a school project and she thought that the sunflower was just perfect for it. I gladly gave her one flower and made a new friend! The picture is great. I love that the sky is the background. Very nicely done! Join in and write your own page! It's easy to do. How? Simply click here to return to Garden Pictures.